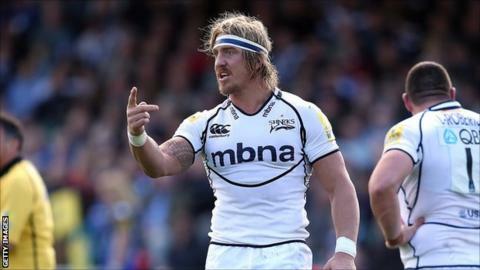 Sale Sharks number eight Andy Powell has been fined £5,000 after admitting using foul language and making an offensive hand gesture to spectators. The incident happened during his side's 31-10 Premiership defeat at Bath, although £4,000 of Powell's fine is suspended until the end of the season. Sale winger Tom Brady has been banned for two games after being found guilty of committing a dangerous tackle. It follows a challenge from Brady on Bath number eight Ben Skirving. The defeat kept Sale, who have lost all five matches this season, bottom of the Premiership table. Both players attended a Rugby Football Union disciplinary hearing in Leeds on Tuesday.